The automated “Wiesel” in Nuremberg was constructed by converting a standard swap-body vehicle. DB Schenker is the world's first logistics service provider testing an automated "Wiesel" at its site in Nuremberg. This vehicle manufactured by KAMAG has been developed to transport swap bodies at logistics yards and can move these autonomously. The "Wiesel" serves to analyze and evaluate the automated processes. The vehicle has been developed for the use on company grounds only, and won’t be deployed in public spaces. 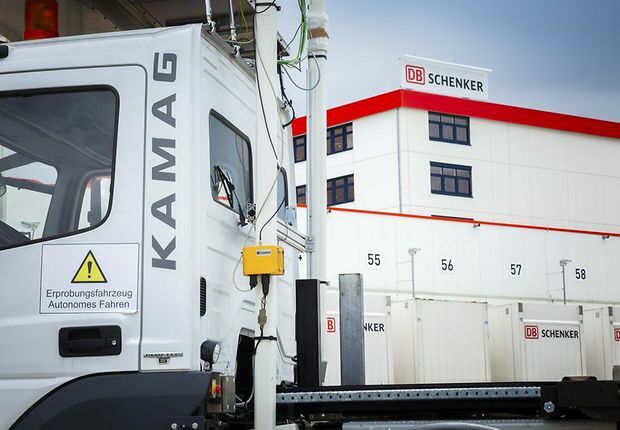 KAMAG and DB Schenker, two leading global companies, are cooperating to push forward jointly the innovation topic of automated driving. Erik Wirsing, Vice President Global Innovation at Schenker AG, said at today's presentation of the "Wiesel": "Digitalization improves efficiency throughout the entire transportation ecosystem. The use of driverless transportation systems is already an important component of our logistics processes. The evaluation of the test phase will show how we integrate the system into our overland transportation system." Managing Director Bernd Schwengsbier from KAMAG: "The pilot project allows us to analyze the potential of the technology in specific everyday logistics applications. This will help us to further develop and improve the technology. With our automated guided vehicle we make a contribution to increasing the efficiency of our customers." In the long term, the aim is to maximize the cost-effectiveness of automated swap-body vehicles and to match the turnaround time of vehicles manned by drivers. In comparison with regular swap-body transporters, potential benefits include reduced personnel costs, longer maintenance intervals as well as a resource-optimized operation. The automated operation of the "Wiesel" reduces pollutant emissions and noise. In light of the increasing staff shortages in the logistics industry, the autonomous vehicle can also help alleviate staffing issues. Moreover, using automated vehicles improves the overall safety level on logistics yards, where human error is considered the main cause of accidents. The very precise sensors help to minimize the risk of injuries and damages to the infrastructure. In terms of safety and thanks to the sensors, the vehicle can detect obstacles and stops automatically whenever necessary. Adding to this, during the tests executed by DB Schenker the vehicle can be stopped at any time by using a radio remote control.